October, among other things, is also Down Syndrome Awareness Month. I have been writing a letter and sending it out on October 1st since 2000. (I checked) At that time, my first son, Flynn, was 5 years old. He is now 23! I have shared lots of information about Down syndrome over these 18 years. If you are interested, I hope you will set aside some time in October and maybe just see what you can find on your own. If you get a chance and want to watch an episode of “Born This Way” on A&E Network, it is a great show and advocates for people with Down syndrome. So here is an update about Flynn for 2018. Last year he had just started attending Pioneer Center for Human Services in McHenry. He is still attending there and loves it. We have agreed that we can just call it his School, so that is what we do. They have many activities through the week and he packs his own lunch and gets ready each morning with minimal help. We do wake him up, but once he is moving he does very well. Pioneer Center has really expanded their Special Olympics teams. He has competed in Bocce Ball, Basketball, Bowling, Soccer, Track and Field, Volleyball, and Flag Football! He certainly keeps us busy! His Basketball team was able to play at Sears Center and we had courtside seats! Bowling was in an Alley with 128 lanes all side by side! 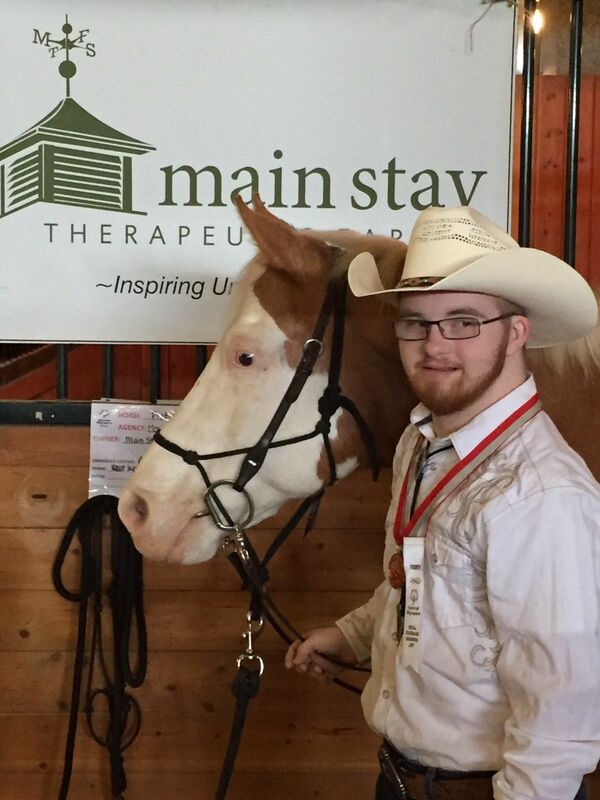 He is still riding a horse at Main Stay Therapeutic Farm. He is an accomplished rider. GiGi’s Playhouse in McHenry started offering Speech Therapy last spring and he started sessions this year as well. So he is quite busy! Flynn’s dog, Grace, that we got last year also keeps us busy. She has not turned into his companion as much as she has turned into another member of the family, but he still enjoys her. Flynn also watches out for the cats, which Grace likes to torment. She is a very sweet pooch and we enjoy walking her and playing with her in the backyard. Flynn’s greatest passion continues to be World Wrestling Entertainment. (WWE) If you have any questions about anything related to WWE he would love to talk to you about it. Thanks to Beth he now even has all of the wrestlers on his iPad which has a communication app that he can use to communicate. He has been using it more since his speech therapy began. It is very helpful because even though he knows ALL the wrestler’s names from memory, I don’t. I was so proud of him when he used it to tell me about an upcoming match in the car a few weeks ago. Beth and I are taking him to Monday Night Raw in Chicago next Monday. He is excited, and I have to say I am looking forward to going since Beth has been in contact with one of the Super Stars via Flynn’s former Social Worker. Thanks for reading. Thanks for being aware. Thanks for sharing the awareness. I’ll just sign off with one request: When talking about people with Down syndrome, remember to put the person first. They are not Down’s people, or Down’s kids or Down’s babies. They are people first so by saying people with Down syndrome, or kids with Down syndrome or babies with Down syndrome we put the person first and remember that they have more in common with all of us than things that are different.